Paul Posluszny was a member of the Bills’ 2007 draft class, and seeing two members of that draft class depart over the past two weeks has made things feel a bit different in the locker room for him personally. Poz and top pick Marshawn Lynch developed a friendship when they both trained at the same pre-draft training facility in Arizona. After they were drafted they joked about meeting in the hole for the first time in practice. Entering their second NFL seasons Lynch, Poz and Trent Edwards, the team’s top three picks in 2007 were all starters in key positions. But Poz saw a different part of the business the past two weeks with Edwards’ released due in large part to performance and Lynch moved via trade to help strengthen the franchise with respect to the future. “It’s a tough situation,” said Posluszny. “I don’t know how to take it. It’s personal because those are the guys I came in with, we got drafted together, that class in 2007. It goes to show there’s a lot of turnover in the NFL and things can change in a hurry. We’ve got to concentrate on the day-to-day and concentrate on our work each day and go from there. With Lynch and Edwards gone, Posluszny is the last remaining member of the 2007 draft class on the roster. After just a week with the Jacksonville Jaguars QB Trent Edwards has been elevated to the #2 QB role for the Jags upcoming game against the Bills in Buffalo Sunday. The Florida Times-Union is reporting that Edwards, who served as the team’s 3rd QB last Sunday, is now the backup behind starter David Garrard. The Jaguars released former backup QB Todd Bouman leaving Garrard and Edwards as the only QBs on Jacksonville’s active roster. The New York Jets were the one other team that put a waiver claim in on Trent Edwards Tuesday, along with the Jaguars who were awarded the former Bills QB. But Ryan’s intentions were decidedly different than that of Jacksonville and he wasn’t afraid to admit it. Though the Jaguars are having far more production problems at quarterback than the Jets, you wonder if Jacksonville had the same idea knowing they’d be facing Buffalo in a week and a half. The Bills QB contingent now consists of Ryan Fitzpatrick, Brian Brohm and Levi Brown after the release of Trent Edwards. But Edwards’ former teammates will see him again in just two weeks. That’s because Edwards was claimed on waivers by the Jacksonville Jaguars. That according to ESPN’s Adam Schefter. Jacksonville plays Buffalo at Ralph Wilson Stadium in Week 5 on Oct. 10. The Jags have not been happy with their QB production thus far this season, so seeing them put a claim in for Edwards is not surprising. Head coach Chan Gailey was asked how Trent Edwards took the news that he was being released by the only NFL team he had ever known. Fred Jackson, who also spoke to Trent, indicated that the now former Bills QB was disappointed. There are a number of places where Trent Edwards might land in the NFL now that the Bills have released him. Naturally going to a team where the offensive system is completely different would represent a catching up process of sizable proportions. Everyone remembers the process Brian Brohm had to go through when he came to the Bills at exactly the same point of the season. Still there are 10 NFL clubs with just two quarterbacks on their roster right now, which could entertain adding a third. Here’s the list. When it comes to Buffalo’s game plan each week Chan Gailey is obviously at the controls, but he does seek input from his starting quarterback and with a new signal caller under center this week, Ryan Fitzpatrick confirmed that there will be conversations before the game plan is formulated by the offensive staff Tuesday. Fitzpatrick went 5-4 in his time as Buffalo’s quarterback last season counting relief appearances. Bills head coach Chan Gailey announced that Ryan Fitzpatrick will start at quarterback this Sunday in New England. “We’re looking for a spark,” said Gailey. Gailey said this is the move going forward and is not just a one week thing. He said Trent Edwards handled the news very professionally. 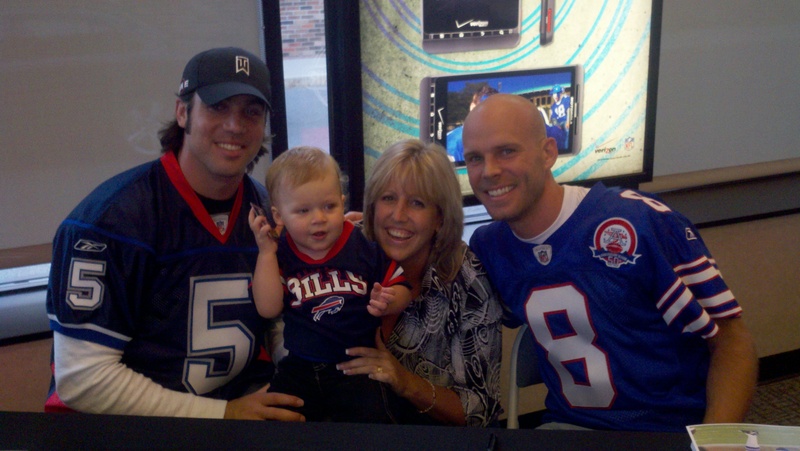 Brian Moorman and Trent Edwards were at the Verizon Wireless store in Rochester Tuesday evening. They met Bills fans, took photos and signed autographs and also met with the Verizon Wireless staff as part of the club’s partnership with Verizon. Here’s just one example. While the brunt of the criticism for the Bills has been aimed at Trent Edwards and to a lesser degree Chan Gailey, it’s interesting to note what they both feel will solve some of the problems the team experienced on offense in Week 1. Bills head coach Chan Gailey after Sunday’s game commented on his dissatisfaction with the way he designed the run game scheme for the Dolphins. And Trent Edwards followed that up with respect to the protections when asked about the penetration that Miami got on Sunday. With a direct line of communication between himself and the head coach Edwards will likely express the same to Gailey as he did to the media. I’m expecting the run game to be more effective than it was last week. The task for the offense overall however, gets no easier this week against a formidable Packers 3-4 defense. Buffalo’s offense has had its share of problems the past couple of years against 3-4 defensive fronts. Facing it in practice every day however, can only help familiarize the Bills offensive lineup with the many different looks that front can present. “I think it’s helped me out a lot,” said Trent Edwards. “I think it’s helped the offensive line out a lot. I know that we faced some 3-4 defenses last preseason that we had never faced because we were in the 4-3 so some of those guys hadn’t seen the looks. Head coach Chan Gailey officially brought the QB competition to a close Saturday. Though it was fully anticipated, Gailey officially named Trent Edwards his starting quarterback after his strong preseason. Appearing on 103.3’s Shredd and Ragan show this week, Bills GM Buddy Nix commented on the training camp that current starting QB Trent Edwards had when asked which signal caller had the best overall performance this summer. Edwards has remained the starter since training camp opened in late July and he’s expected to start on Saturday night against the Bengals. With Buffalo’s 1st team offense now closing in on two years without scoring a touchdown in the preseason, head coach Chan Gailey is making an effort to keep it from turning into a situation where the players on offense make it a bigger issue than it needs to be. Outside observers have been asking Trent Edwards and company about the fact that the first unit on offense hasn’t been in the end zone since the last time the Bills played the Colts in the preseason (Aug. 24, 2008) and that unit was led by J.P. Losman, who was filling in for an injured Trent Edwards. Gailey is trying to impress upon his players as well as anyone else that will listen that the past is the past and the new offensive system makes what happened in the past irrelevant. “You obviously want to score every time you touch the football. That’s the objective of offensive football,” Gailey said. “I don’t see the pressure in that. I want us to be successful. I want us to execute. I want us to do the little things that allow you to be able to do that. But I don’t see pressure in that. Edwards has done his best to take that approach, but since he is a part of that recent history on offense, it’s likely that it will continue to follow him and Buffalo’s offense as fans and the media remind him and his teammates of it. Trent Edwards has heard his head coach address the media. He knows nothing is set in concrete with respect to the starting QB job. That’s why he’s taking the following approach to help ensure he’s still atop the depth chart when the preseason has concluded. Edwards realizes he has to lift the collective play of the offense with a few plays of his own. Hopefully he can make some of the same deep ball completions that he has in the camp practice setting with the likes of Lee Evans and Roscoe Parrish and get the offense rolling.